Southport has launched ‘Southport Welcome,’ a new initiative that aims to remind coach operators and tour planners why the traditional seaside destination is coach and group friendly. 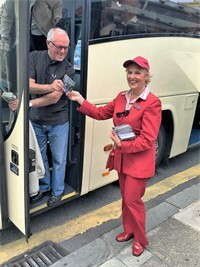 At the heart of the initiative is husband and wife team Rod and Wendy Wright who, as the town’s coach welcome hosts, meet and greet coaches arriving on day excursions between March and October – a role they have fulfilled for some time. ‘Southport Welcome’ is also highlighting the town’s dedicated, secure coach parking, and coach parking charges that have been reduced from £10 to £5 for up to 12 hours. Southport said it is one of the few destinations in the UK to offer secure coach parking. The purpose-built facility, located at the Southport Eco Centre at Promenade, and a short distance from the town centre, offers toilet and refreshment facilities for drivers. “We are also one of the very few destinations to reduce our coach parking charges,” added Steve Christian. According to Steve, Southport is seeing an increase in demand for experiential tourism: “There’s a noticeable increase in the number of visitors looking to do more than shop on Lord Street, walk on the pier, or attend our flower, air and fireworks shows. Key events in 2017 include: Southport Food and Drink Festival – June 2 to 4; The Open, Royal Birkdale – July 16 to 23; Southport Flower Show – August 17 to 20; and the Southport Air Show – September 15 to 17. For more information about what to see and do in Southport and the wider area, go to www.visitsouthport.com. Contact the Tourist Information team based in The Atkinson in Lord Street on 01704 395510, or email [email protected].